The poll builds on the results of an earlier Kaiser survey in April that identified high drug costs as the public’s top health care priority for Congress and the president. Drug costs have gained attention in the past year in part as a result of controversies surrounding Sovaldi and other new hepatitis C drugs, which can cure most cases of the deadly liver disease but at a price of $84,000 for a 12-week treatment. The high cost has strained Medicaid and Medicare budgets and left private insurers scrambling. Half the public say they take prescription drugs. More than three quarters of those say they are easy to afford, with only one in five saying they have difficulty paying for them. But about a quarter of respondents said they or a family member have not filled a prescription in the past year, while 18 percent have cut pills in half or skipped doses to save money, the poll found. 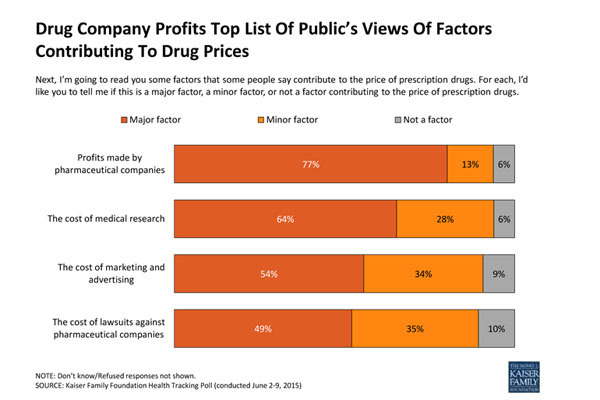 More than three-quarters of the public cited drug company profits as the No. 1 reason for the high costs, followed by the expense of medical research (64 percent), the cost of marketing (54 percent) and the cost of lawsuits against pharmaceutical companies (49 percent). About 10 percent of respondents also blame insurance companies, saying they require enrollees to shoulder too great a share of drug costs. The survey also found most Americans are still not paying attention to the latest challenge to the Affordable Care Act in a case called King v. Burwell. The Supreme Court is expected to decide this month whether to cut off government subsidies to millions of people in about three dozen states that rely on a federal insurance marketplace, rather than a state-based marketplace. About 72 percent of respondents say they have heard little or nothing about the case. However, the survey found more than half of respondents were “very” or fairly closely” following news about the 2016 presidential campaign. About 39 percent of respondents said they were closely following news about the House of Representatives banning abortions after 20 weeks of pregnancy — the most closely followed health policy issue. The poll of 1,200 adults, conducted from June 2 to June 9, had a margin of error of plus or minus 3 percentage points.